I have been attempting to keep my sewing area (aka my dining room) a little more tidy so I haven't accomplished as much as I would have liked this week. I have a hard time getting everything out to sew, and then having to put it all away every single day. Hopefully one day I will have a dedicated sewing space. 1. I did finish this queen size wonky cross top. It has also been basted and I have even done a little quilting. There's a long way to go with that though. I am doing straight lines and I have found it to be much less boring if I just do a little at a time. 2. I started about 80 more flying geese for my daughter's quilt. 3. Last night I made 2 converging corners blocks for the September quilt for the wish circle of do good stitches. I think this was a great block to use for the bee because I don't think I would have the patience to make an entire quilt worth of these! 4. One new project is that I am going to be participating in the Travellin' Pic Stitch blog hop. The only English paper piecing I have ever done with Christmas stockings. I guess I should add these to my WIP list since before I pulled them out this morning, I thought they were done. Oops! But I enjoyed it. I am also looking forward to a project that doesn't require me getting out my sewing machine. I am going to make rose stars. I don't know how big my project will be, maybe a mini quilt, maybe bigger depending on how it goes. 5. I have signed up to do some swaps. In addition to the DGS wish circle swap, I have also signed up for Mouthy Stitches and Pillow Talk Swap round 9. I think I am a little bit addicted to swaps. But I am looking forward to meeting some new people. I am still waiting for the partner assignments for these last two and I am hoping to get started on something for my wish circle partner this week. 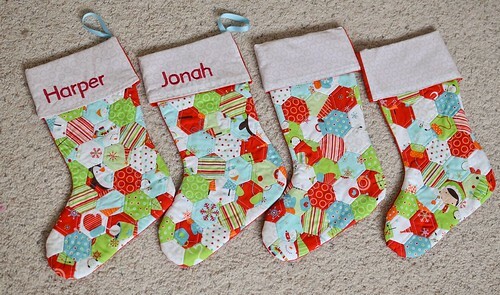 Love the Christmas stockings, can it be the time of the year when I think to think of getting ready for Xmas?? Already? I love the converging corners blocks. I've had that one bookmarked for a long time, though it sounds a bit tedious. 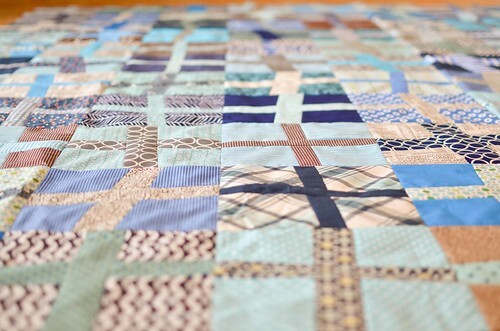 loooove you cross quilt - on of my favs. Also love the stockings - are they from Camille's pattern? If so, I made one too -SO cute! You have a lot of fabulous projects going. I particularly love the wonky crosses. I really like your wonky cross quilt. Those colors are great!